Der Artikel Johann Sebastian Bach (1685-1750): Französische Ouvertüre BWV 831 wurde in den Warenkorb gelegt. 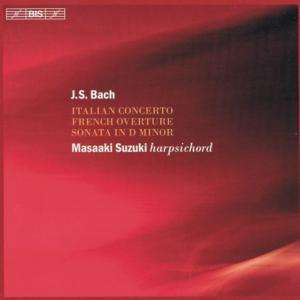 In between concerts, recordings and tours with his Bach Collegium Japan, the indefatigable Masaaki Suzuki still manages to make time for the harpsichord – to the joy of reviewers and music lovers alike. His previous recordings of Bach’s keyboard music have been highly praised. Most recently the French Suites (BIS-CD-1113 / 14) was made Critic’s Choice in American Record Guide, and the reviewer in Fanfare called the double-CD ‘an immensely stimulating listening experience…the most compelling set of these utterly winning suites.’ The Partitas (BIS-CD-1313 / 14) met with equal enthusiasm, and was described as ‘a distinguished and deeply considered account’ in The Gramophone and as ‘fascinating, probing and compelling versions’ by the Goldberg website. Now the turn has come to the Italian Concerto and its companion piece the French Overture. The two works, which make up the so-called Clavier-Übung 2, demonstrate Bach’s familiarity with two main orchestral genres – the concerto and the overture suite – which respectively represent two important national styles of the day, Italian and French. As Yo Tomita argues in his liner notes, Bach’s aim was to extract these two distinct styles and give them expression in two keyboard works. Maybe he succeeded too well as the Italian Concerto, in particular, was hailed by some contemporaries as an indication that Bach was moving away from his ‘old-fashioned’ contrapuntal style… Highly characterful music then, in a programme which is complemented by the Sonata in D minor, a transcription – probably by the composer himself – of the Sonata in A minor for solo violin.